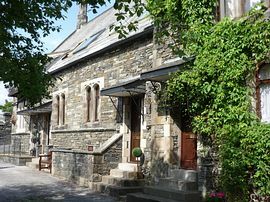 A few steps away is the bustling town of Bowness-on-Windermere with a wealth of independent shops, intimate restaurants, traditional pubs and contemporary bars and cafes, to suit young or old. 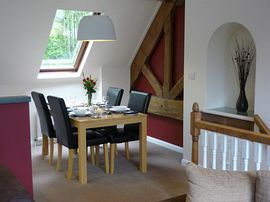 Whatever your interests - walking, water sports, sightseeing, shopping, dining or just relaxing, Teal Cottage is the perfect base for your Lakeland holiday. 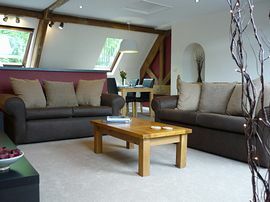 A large contemporary lounge is located on the first floor, to take advantage of great views of Lake Windermere and Claife Heights; original beams and quality furnishings, including large screen TV with DVD player and selection of DVDs, radio/CD player with ipod docking station, local information and books. Also on the first floor, a fully fitted kitchen, with integrated dishwasher, fridge, electric cooker and hob, washer/dryer and microwave and dining area with contemporary dining table and 4 chairs. On the ground floor are two bedrooms. A comfortable double bedroom with solid oak king size bed and matching bedside drawers, fitted double wardrobe, hairdryer and mirror with en-suite shower room, with toilet, wash basin and shower cubicle. A light and airy twin bedroom with two single beds, bedside drawers, fitted double wardrobe and dressing table, hairdryer and mirror. A family bathroom is also located on the ground floor, including full size bath, toilet, wash basin and shower cubicle. A private car park is situated behind the property. 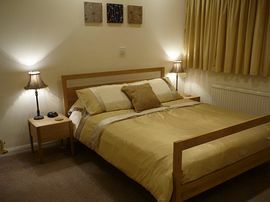 Fresh bed linen and towels are supplied at no extra charge. We regret pets are not accepted and the property is unsuitable for small children or babies. Smoking is not permitted in the property. From the South - leave M6 at Junction 36 and take A590 towards Kendal (road changes to A591 after 3 miles). Follow Windermere signs and turn left (passing Booths supermarket). 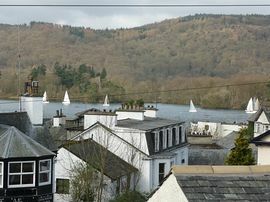 Drive through Windermere town centre and down the hill. At the bottom of the hill (Bowness), turn left at the roundabout (by Tesco), take first left then first left again into Brantfell Road. Teal Cottage is on the left (the old schoolhouse). Open all year round. Short breaks available outside peak times. Saturday changeover. The property is available from 4.00pm on arrival and must be vacated before 10am on day of departure, unless otherwise agreed.